Quick Recovery. Meniscus Tear Treatments. A cushion and shock absorber of the knee, the meniscus (medial and lateral) is one area of the knee prone to tearing and degeneration. Composed of fibrocartilage, a healthy, intact meniscus is important for protecting the knee cartilage and properly distributing force. Meniscus Tear? Give us a call or email us today at 980-859-2340 or [email protected] to schedule a comprehensive evaluation of your meniscus injury with one of our Board Certified, Fellowship trained Orthopedic and Bio-Restorative Medicine Physicians. Traditionally, the only treatment for those with a painful, torn, meniscus tear is painful, invasive major surgery. Now, there is a viable alternative option for you. The treatment utilizes your body’s own stem cells and other healing mediators called Autologous Stem Cell Treatment.A Bio-Restorative Stem Cell Procedure of the meniscus tear is an ultra-minimally invasive same-day non-surgical procedure designed to alleviate pain, improve function, and aid in tendon and Environmental Restoration. 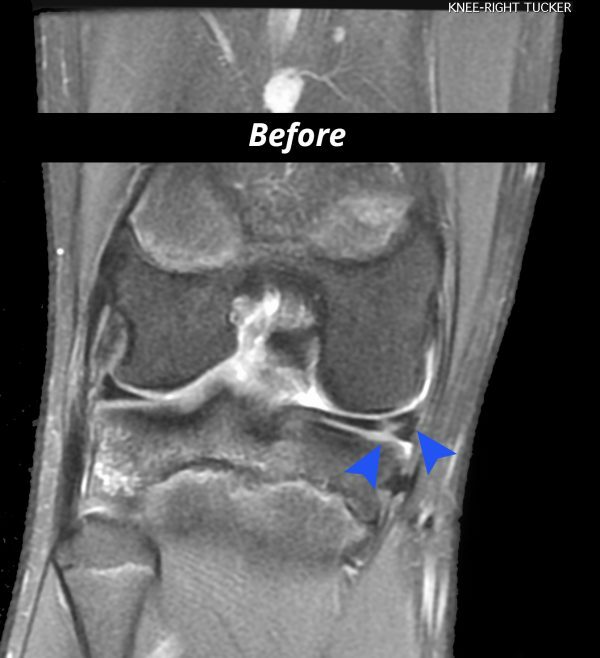 In addition, to being less invasive than surgery, the procedure conveys less risk of complications, and in in the case of meniscus much less downtime and pain following the treatment.Patients typically find themselves seeing a difference as early as 6-8 weeks as opposed to an average of 6-8 months or more recovery after surgery.In other words, the Stem Cells from your own body harness your own body’s healing capability to naturally restore, reduce pain and get you back to doing the things you love. Knee arthroscopy is a knee surgery procedure in which parts or all of the meniscus may be shaved (“cut-out”) and thrown in the trash. 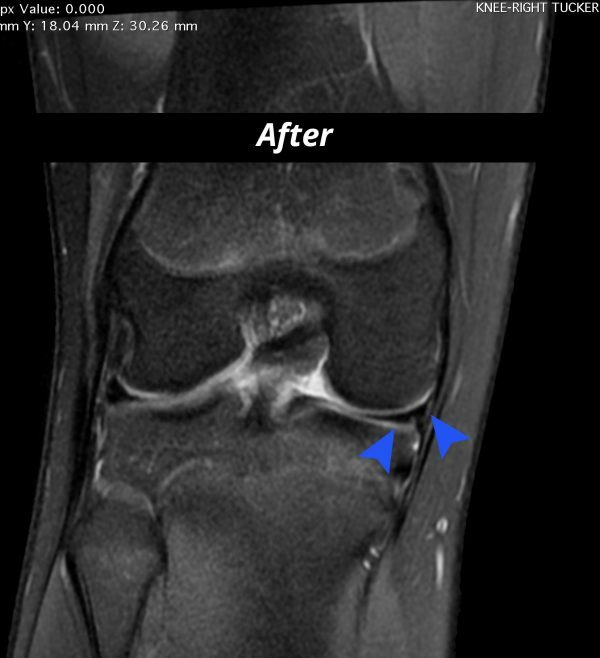 There is a profound downside, which is a loss of valuable meniscus tissue. Even with the most advanced Stem Cell treatment, the entire original meniscus cannot be regenerated and therefore part of it is gone forever. When the meniscus is removed there is less cushion and shock absorption between the knee bones and cartilage resulting accelerated breakdown and development of arthritis of the knee. The procedure is meant to alleviate pain, but unfortunately, there have been numerous studies showing that knee meniscus surgery does not work. The risk for heart attack, strokes, blood clots, major infection, pneumonia, nerve injury, and general anesthesia can be significant. Given the risks, extended pain and recovery process, many find themselves questioning whether surgery is worth those odds.With all these flaws, wonder why Knee Meniscus Surgery is so ubiquitously popular? Did you think that Orthopedic Surgery is well proven? At its foundation, iOBX was created to provide cutting-edge, remarkable Bio-Restorative Orthopedic Stem Cell Procedures within a concierge, patient-centered experience. The Board-Certified Physicians at iOBX, are extremely experienced in successfully treating meniscus tear and have devoted their careers toward treating Orthopedic conditions, using Stem Cells from the patient’s own body. We are 100% dedicated to Orthopedic Meniscus Tear Stem Cell Treatments (You probably wouldn’t go to a part-time brain surgeon, So why would you go to part-time Stem Cell doctor or even worse a mid-level Physician Assistant or Nurse Practitioner). iOBX Physicians, have extensive experience in precisely implanting torn meniscus tear using cutting-edge precision guided imaging technology. Our amazing physicians always make sure to put the patient’s needs first in a complete patient-centered process, that includes concierge in-depth consultation with a medical doctor, and continuous check-ups even after the treatment. The wonderful work of our team is reflected in all our independent 5-star reviews. Meniscus Tear? iOBX has developed a Remarkable and Proprietary 3 step process using your body’s own amazing Stem Cells healing capabilities. Unlike many facilities that use non-living/dead, potentially contaminated amniotic/umbilical/placental stem cell products, we collect stem cells from one’s own body and analyze preparations for quantity, and viability to ensure that we are consistently delivering a high-quality restorative Meniscus Tear stem cell treatment. Harvesting of your body’s bone marrow and fat tissue using cutting-edge techniques allows for the collection of 200-300% more stem cells vs using lesser, “easier” techniques in harvesting those cells. Within our Advanced Onsite Orthopedic Laboratory, your tissue is safely and manually processed using proprietary, FDA compliant protocols to optimize final bone marrow and/or fat stem cell and bone marrow PRP formulations dependent on the areas we are treating. Our ability to flexibility process your tissue to achieve extremely high quantities of your own body’s stem cells for the condition we are treating you for is critically important, as is our ability to count and analyze the viability of these cells. This is extremely critical for Meniscus Tears because this will only hold a small volume. At iOBX we have the ability to DIRECTLY VISUALIZE the implantation of your own Stem Cells directly to abnormal or torn parts of your Meniscus Tear. To see this in action click here. Precision placement of your body’s own ultra-concentrated, purified Stem Cells is crucial to a successful outcome. Along with a meticulous pre-treatment evaluation process and post-procedural rehabilitation course, this is the reason why more than 90% of our meniscus tear patients are satisfied with their results. To begin your journey to healing, please call us to learn more about our comprehensive evaluations as well as our free “Inspired by Bio-Intelligence” onsite seminars.